Working from home is on the rise, so whatever size space you have to call your office – we can help! This contemporary home-office is simple, yet effective. The thicker partitions and shelving give a modern feel to a sleek design. 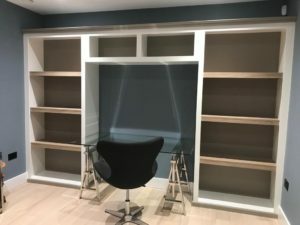 We have built customised shelving in a combination of matt White and Bordalino Oak, with Stone Grey backs. Combining the finishes in this way gives a level of interest, and we have so many finishes to choose from. We have incorporated plenty of space for filing, reference books & the occasional family picture. With 50% of UK workforce to work remotely by 2020*, plan ahead and speak to one of our Designers!